The USAF Air Demonstration Squadron ("Thunderbirds") is the air demonstration squadron of the US Air Force. They will perform at the Punta Gorda Airport Air Show this Weekend. As Part of Team Punta Gorda's Beautification Program Team Members are painting and decorating old bikes and placing them at various places in town. This newest one was just installed yesterday by artist Carol Thorne. Note that it is meant to attract visitors to the Wildlife Center... note baby bird face on the yellow bike. The Damn created to supply Punta Gorda water at the confluence of Prarie and Shell Creeks. Designed in the Classical Revival style by architects Leitner and Henson , it was built between 1927 and 1928 by Paul H. Smith Additions were made to the building the 1960s and 1980s but in 1999 it was replaced by a new Justice Center and then fell into disuse. In 2005, the additions having been demolished, the Board of County Commissioners undertook the restoration and renovation of the original 1928 structure that remained. Taken to highlight the powerful columns that define the building. 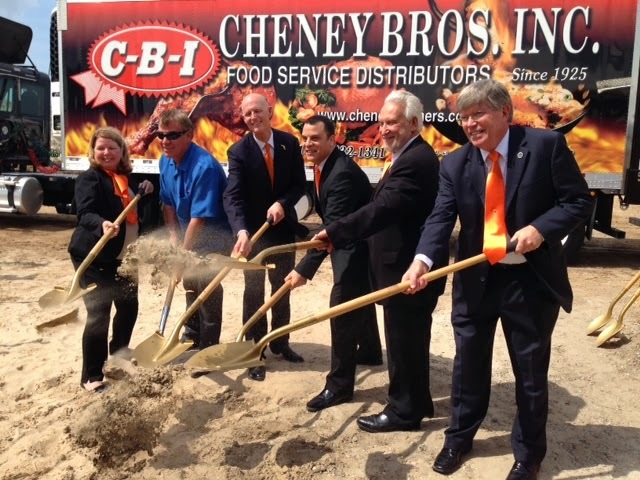 Left to Right: Commissioner Tricia Duffy, Byron Russell, CEO, Cheney Brothers, Governor Rick Scott, Commissioner Chris Constance, Commissioner Stephen R. Deutsch, Commissioner Ken Doherty. Photo provided by T. Duffy. Kim Devine City Councilwomen for District 1 Downtown Area and her beautiful pup.